Paczki are Polish donuts typically made on Fat Tuesday. Enough said. Make this the 12,000th reason I’m glad I married the Mr. If it weren’t for him, I may never have known the glories of Strawberry Paczki. Apparently these donuts were quite popular where he grew up in Michigan, and when we first got married he spent many hours raving about them. Before I tell you about these powdered sugar dusted pillows of fried dough, let’s get one thing out of the way. It’s pronounced PONCH-key, which is what your belly will have after eating one of these. 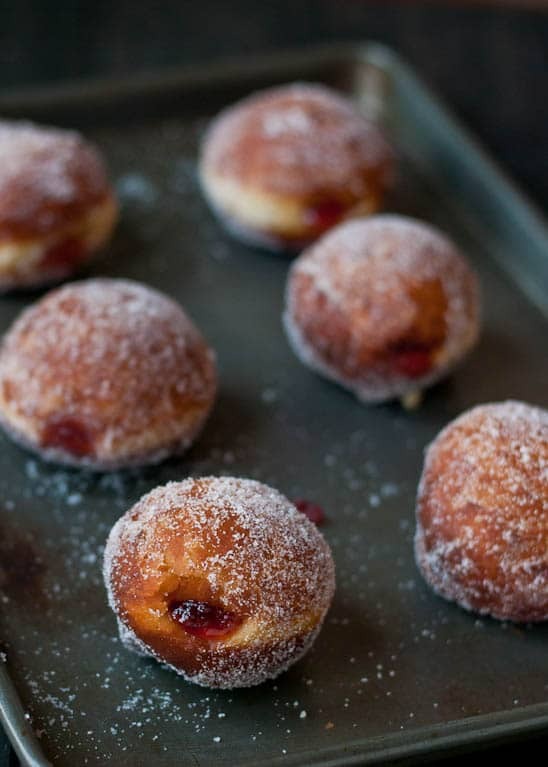 Paczki are actually Polish donuts typically made on Fat Tuesday as a way of getting rid of all the goodies one would normally forego for Lent (sugar, butter, eggs…basically everything I love). If you’re wondering whether paczki are healthy for you, that should give you an idea of the answer. There’s nothing quite like Paczki. 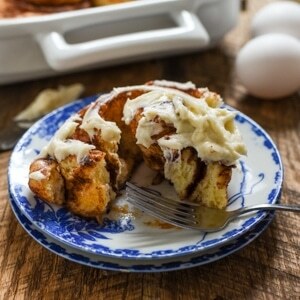 It starts with a fluffy yeasted donut batter that gets perfectly golden and just a tad crispy on the outside. But what makes Paczki really special is the filling. 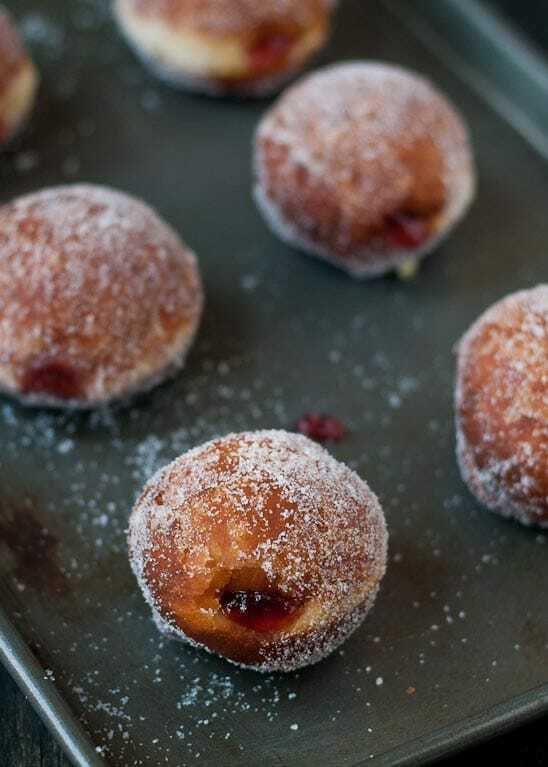 Chocolate, custards, and fruit fillings all give a surprise burst of flavor to these donuts, but our favorite by far is classic strawberry jam. 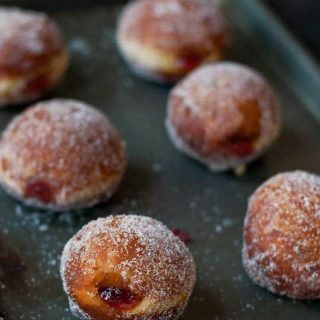 Last year, we spent the weeks leading up to Fat Tuesday scouring the web for local bakeries that make Paczki. At the last minute, I managed to find one, and I made the drive in after-work traffic to snag a few for the Mr. This year, I figured I’d skip the crowds and try making them myself. While not difficult per se, this recipe is labor intensive and requires several steps, so I decided to break it down for you with pictures. This step-by-step photo thing is a new thing I’m trying. Let me know if you like it. One note before we get started. 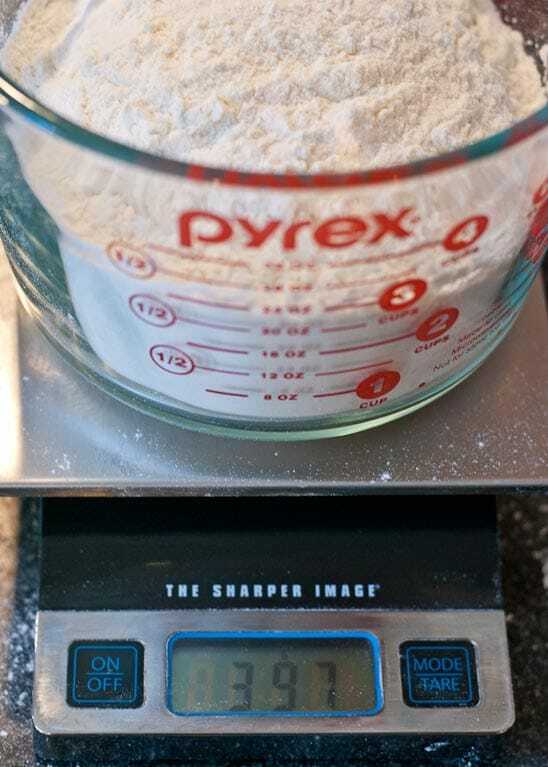 The original recipe for this used grams to measure the flour. I have a kitchen scale so I was able to measure it out in grams, but I also measured out cups and included those measurements as well. One important note: when you’re measuring your flour, spoon it into your measuring cup with a scoop or Tablespoon until overflowing, then level with a knife or bamboo stick (I hoard these from Chinese restaurants. So handy!) Don’t dunk your measuring cup in the flour then level. You’ll end up with a lot more flour packed in that way and your measurements will be off. Make sense? The dough starts with a yeast starter. First, you’ll whisk together yeast, lukewarm milk, sugar, and a little flour. It will resemble pancake batter. You let that mixture sit for an hour until it nearly doubles in size. As you can see, mine started at around 2 cups and ended around 4. The batter will be sorta frothy/foamy, like the top of your cappuccino. 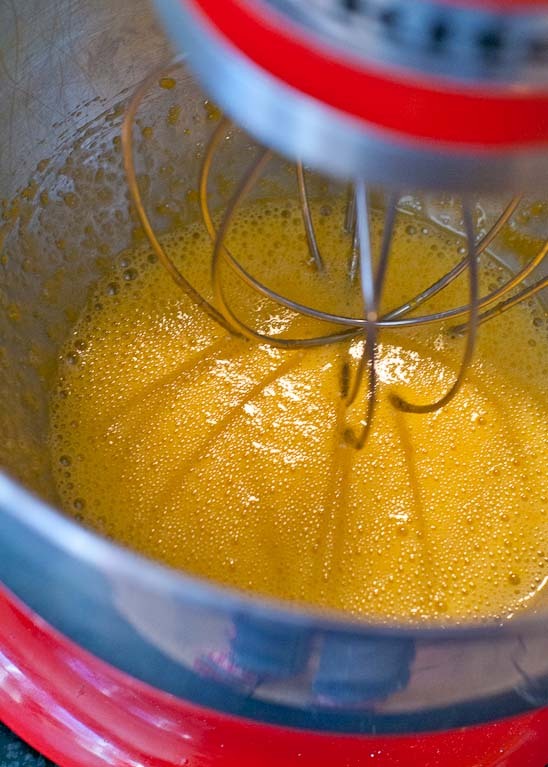 Once the starter is frothy, add the eggs and sugar to your stand mixer and beat them with the whisk attachment until frothy. Add in the starter and 3 Tablespoons of flour and beat until well combined. Switch to the paddle attachment. Add the rest of the flour mixture in about 1/2 cup increments, beating well after each addition. The dough is ready when it begins to pull away from the sides of the bowl. It should be tacky, but shouldn’t stick to your finger when touched. You may need to beat in a few more Tablespoons of flour if it’s still sticky. Cover the dough and let it rest for an hour. It will nearly double in size. Lightly flour a baking sheet. 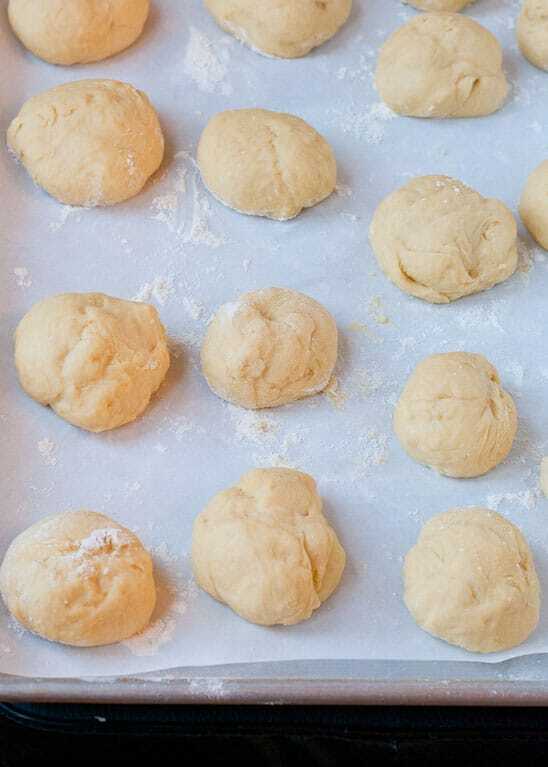 Grab about a 1/4 cup portion of dough and roll it into a ball in your hands. Repeat with remaining dough. You can see my dough wasn’t entirely uniform and it didn’t look particularly smooth. That’s okay, it’ll smooth out as it rests. 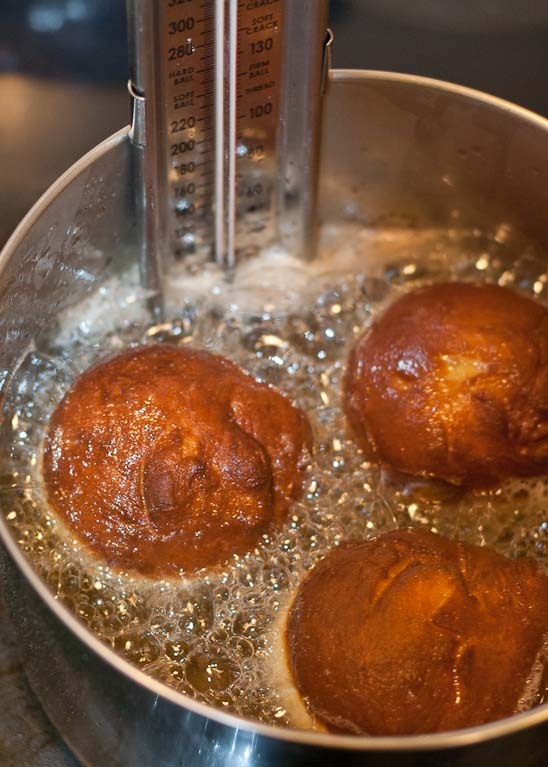 Allow the dough balls to rest for 30 minutes while you heat the frying oil in a deep sauce pan to 375 degrees. After letting the individual donuts rest, drop them in the hot oil and fry for 2-3 minutes per side or until golden brown. I usually cut open the first one just to make sure they’re getting cooked clear through. If they’re not, fry for longer. If they’re burning on the outside and underbaked on the inside, you can turn down the heat and let the oil cool slightly. Remove the donuts to a paper towel lined plate. When they’re cool enough to touch, use a knife to poke a small hole from one side to the other. I like to twist it around slightly to make sure there is enough space for the filling. 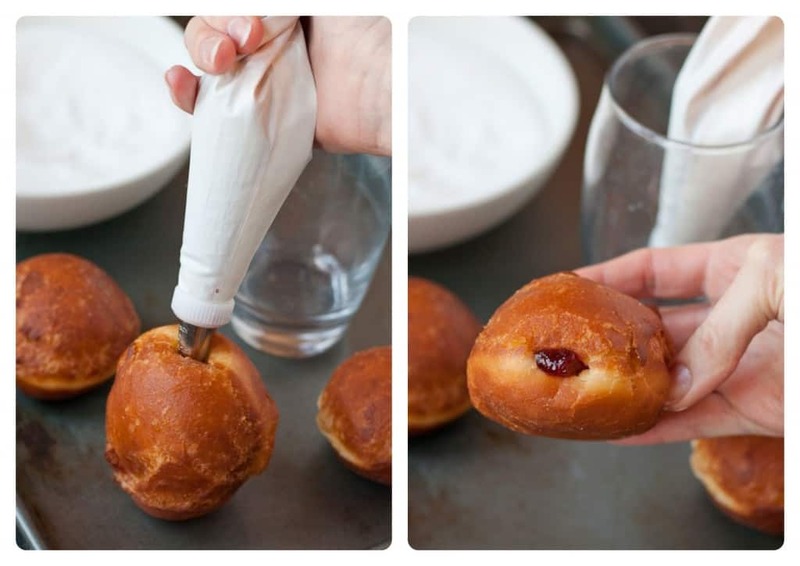 Fill a piping bag with strawberry jam, insert the tip into the donut and squeeze until the jam starts to pool at the top. Repeat with remaining donuts. Roll the donuts in granulated sugar. ….Then cover them with a generous (and by generous I mean irresponsibly thick) layer of powdered sugar. Eat. Repeat. It is Fat Tuesday, after all. Do you have any Fat Tuesday traditions? Are you wanting to pick some up? Our #SundaySupper team has over 50 ideas for getting the most out of this holiday. 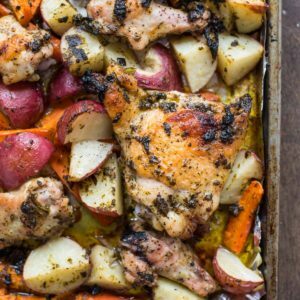 Be sure to check them out below the recipe! 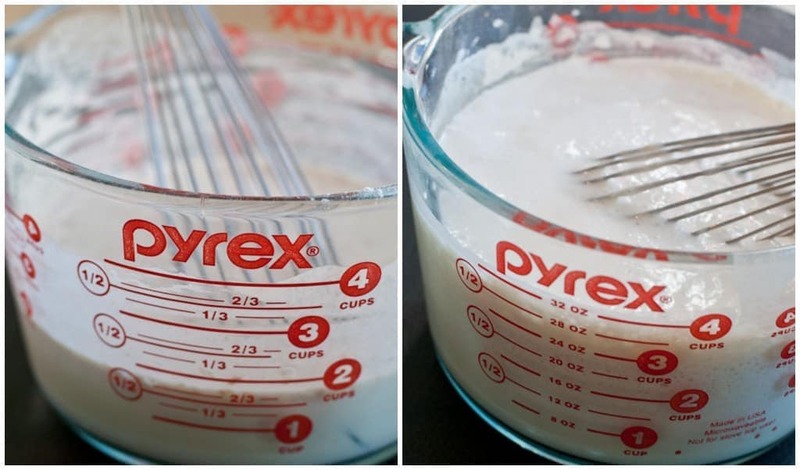 To make the starter, whisk together the yeast, flour, sugar, and milk in a large measuring cup. The mixture should resemble pancake batter. Set the mixture aside for 1 hour until it's frothy and doubled in size. 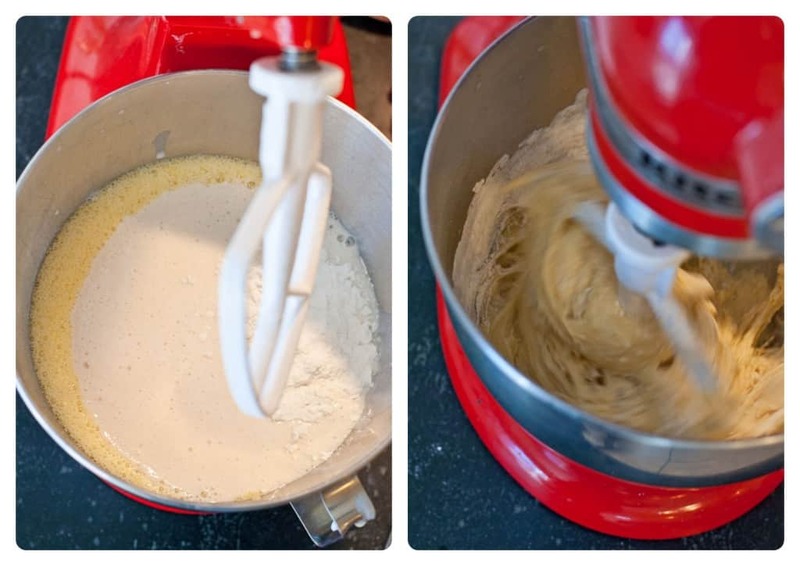 Place the eggs and sugar in the bowl of an electric mixer fitted with the whisk attachment and whisk until frothy. Add the vanilla, lemon juice, and salt and whisk. Switch to the paddle attachment. Add the starter and 3 Tablespoons of the flour and beat until smooth. Add the rest of the flour in about 1/2 cup increments, beating well after each addition. The dough is ready when it begins to pull away from the sides of the bowl and is tacky, but doesn't stick to your fingers. Add the butter at the very end and beat until just combined. Cover the bowl with plastic wrap and set in a warm place to rise for 45 minutes to 1 hour. Dust a baking sheet with flour. Grab about a 1/4 cup portion of dough and roll it into a ball in your hands. Repeat with remaining dough. Cover the dough balls and allow to rest for 30 minutes. Heat the oil in a heavy bottomed pot to 375 degrees. Drop the dough into the hot oil 3-4 at a time and fry for 2-3 minutes or until golden brown on both sides. Use tongs to remove the donuts and place them on a paper towel lined plate. I usually cut it into the first one to make sure it's cooked all the way through. If it's not, increase the time in the oil. If it's browning too quickly, turn the heat down. When the donuts are cool enough to touch, use a knife to poke a small hole from one side to the other. I like to twist it around slightly to make sure there is enough space for the filling. 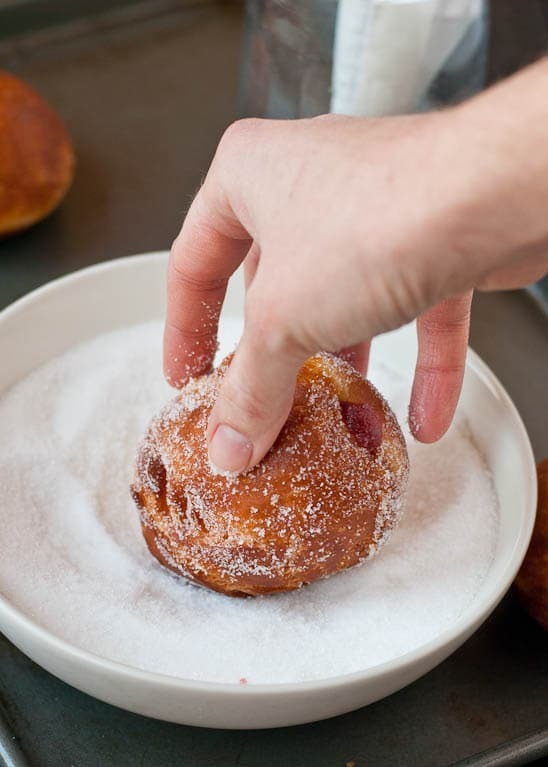 Fill a piping bag with strawberry jam, insert the tip into the donut and squeeze until the jam starts to pool at the top. Repeat with remaining donuts. Fill a shallow bowl with granulated sugar and roll the donuts in the sugar. Sift powdered sugar over top of the donuts. Serve warm or store in an airtight container for up to 3 days. Don't throw away those extra egg whites! Check out my collection of over 50 egg whites recipes! It’s a Fat Sunday Party! Ohhhhhhhhhhh these look good!!! I love them and I will definitely try them! Love your step by step photos. These look so delicious! These look amazing and I LOVE your step by step pictures. They will be a tremendous help when I make my own batch! Thanks for the feedback! It’s encouraging. It took a lot more time to take and edit all the pictures, but if it’s helpful I’m glad to do it! WOW! 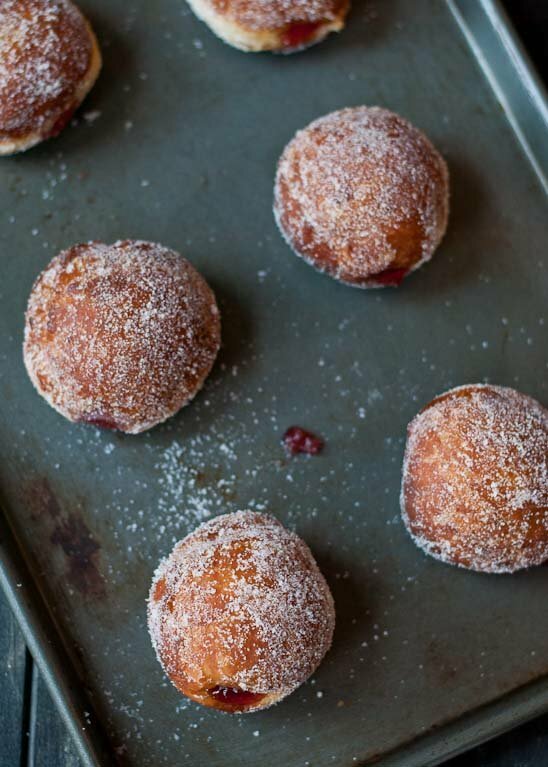 Your filled paczki would be a fabulous way to start my Fat Tuesday…or any day!!! Perfectly made!!! 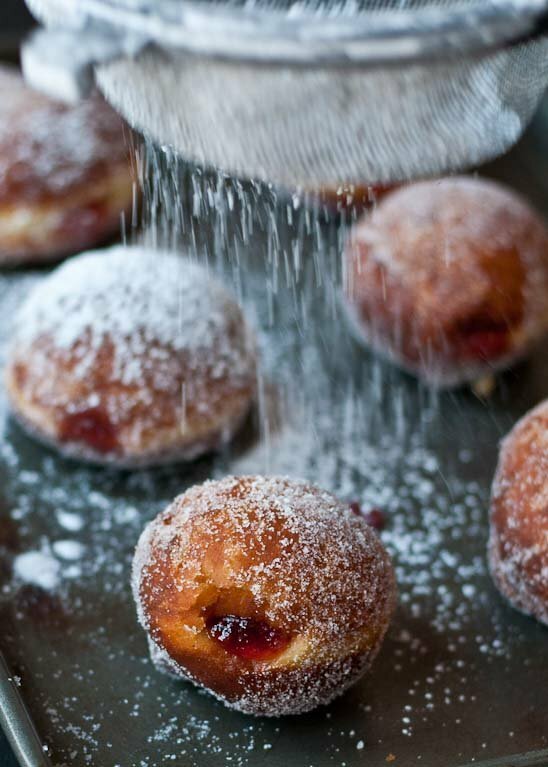 I look forward to Paczki every single year…and yours look absolutely perfect, just gorgeous! I have never made anything like this, wow do they look fantastic!! I’ve never heard of these before, but they sure do sound tasty! This looks great. I love your step by step pics. Thanks Isabel. It’s nice to get some feedback after trying something new. I love paczki but have been having trouble finding good ones, even here in Michigan, so I can’t wait to try these! It does seem like they’re kind of limited to certain areas. Our local Kroger is carrying them this year, but I doubt they’re very authentic. Still delicious though! Oh man, these look fantastic. They look so perfect too! This Polish girl really has to get on making some paczki! I never have. These look amazing! You’ve got to try it! They’re actually not that difficult to make and so delicious. Can you believe I’ve never had a paczki?! I have been missing out! I need to remedy that sad situation ASAP! Definitely! Tomorrow is the perfect excuse to do it! I have a fear of deep frying at home. Is it okay if I just come to your place for paczki? You’re always welcome here Susan! And while I’ve found frying not to be nearly as intimidating as I thought, it’s dangerous that I now feel comfortable deep frying at home. Keep the fear as long as you can! These are my husband”s favourite kind of doughnuts. In the local market there is a fresh bakery that makes all kinds of varieties including toffee. Toffee paczki? That sounds amazing! These are just gorgeous donuts! These sound incredible! They may have to become a new tradition! Thank you for the step by step photos, Courtney! I’m so impressed that you were able to take so many awesome photos while making these babies. I used to get so frustrated washing my hands after every step in order to take a pic. My gawd, your paczki looks SO FREAKING GOOD. Like, smack-my-face-on-the-computer-screen-cause-I’m-trying-to-eat-your-photos good. I use my chopsticks to level off flour all the time. Again, we’re the same person, lol. These look great and authentic but TL;DR. However, let’s get two things straight: 1. Paczki is already plural (same for pierogi), singular is just paczek. Pronounced poncheck/ponchkee. 2. They’re made for Fat Thursday, not Tuesday. Thanks for sharing! Here I am adding an s all over the place! I’ll change that in the post! I’ve never had these, they look amazing! How could they not be after 2 coats of sugar 🙂 I only started doing step-by-step photos in the last few months. They are intense. Very time consuming, I second what Nancy just said, it’s so frustrating having to pause to wash hands. I just spent the last 5 hours making and photographing 2 recipes (one failure 🙁 and my kitchen looks like a grenade went off. I’m like, I don’t have time to clean right now, I can clean after the sun goes down!! But your photos look great and I applaud your efforts, I know how long this took you. I don’t think I’m going to do step-by-step photos for most recipes because I was dyyyying after editing all of them, but I’d like to try to keep it up for the more complicated dishes at least. Let’s be honest, sometimes I don’t wash my hands which is why my camera is covered in flour. So bad. Mmmm these look great ! Amazing photos also . I live in Michigan , do you know where exactly I can find these ? They’re incredibly popular around Hamtrammack (not sure of the spelling?) That’s where my husband used to get them. I have seen packzi all over the interwebs but yours are the only ones I’ve seen with strawberry filling! Which is my favorite. Want.To.Inhale.These. It’s my favorite! Next time I’m thinking I might try to stuff with custard AND strawberry jam. Ya know, if I’m feeling ambitious. Love these. We make them every year. Cannot get enough of them. Yours looks absolutely divine. Love strawberry. Drooling. I want one now and the rest for later. Awesomeness indeed. I have always used my favorite jam, but specialty cake/craft stores often have fruit fillings you can buy if you would prefer that. 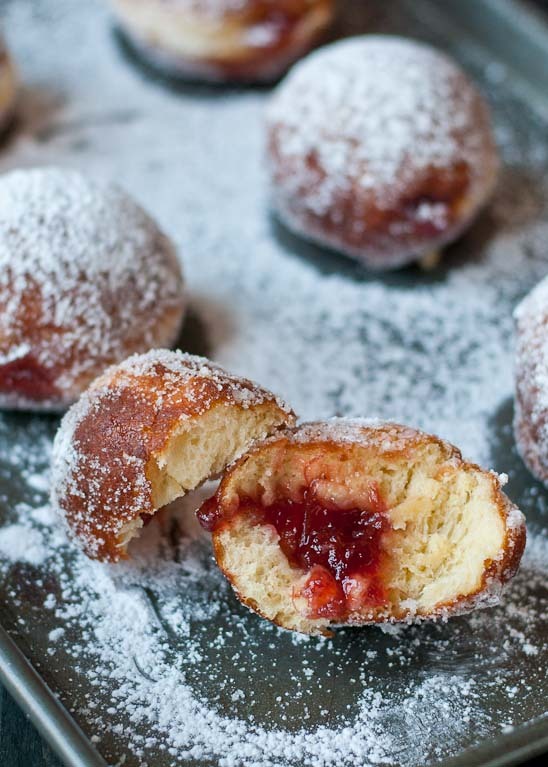 I have many recipes for paczki, and never before have I come across a better recipe to follow than yours. You have actually managed to explain every step in a way that makes it so much easier to understand. I have real trouble with the starter, and as you can imagine, if that goes wrong nothing else matters.I will attempt these beauties, and I do enjoy the store bought ones, but I can hardly wait to taste home made. Thank you for taking the time to explain so wonderfully! I’m so glad this was helpful! I hope everything goes smoothly and you love them! Can the dough be made a day ahead then fried the next? You know, I haven’t tried this, but I think you could if you refrigerated the dough balls before rising. In the morning, take the pan out and let the dough balls rise for 30-45 minutes and then follow the rest of the recipe! Thank you for the great instructions. I have a question however. Iv never made these but have been looking at tons of different recipes trying to figure out which one to make. This one looks best, however every recipe I’ve seen so far rolls the dough out and cuts it with a dough cutter not rolls in balls. They end up looking about the same but if I’m wanting them to look perfect for my first time making them, should I roll out and use a donut cutter/cookie cutter ? I have never tried the cookie cutter method, but you’re welcome to try that if you want to ensure they’re the exact same size. As far as the jam goes, I recommend looking on Pinterest or Google for a jam recipe that looks good! ALso, another question… how do I make homemade jelly? As a Polish girl, I would like you to correct something. Pączek’s festival is a feast marking the last Thursday before Lent. That is why we call it fat Thursday not Tuesday. Eventually, I am glad you had decided to bake this little, traditional goodies.